The Balkan Investigative Reporting Network is issuing a statement after Johannes Hahn, the European Commissioner for European Neighbourhood Policy and Enlargement Negotiation, said he could not react to claims about media freedom violations in Serbia without seeing proof. BIRN is sending its response to all relevant human rights organisations, EU diplomats and international journalists. „The Balkan Investigative Reporting Network would like to express its alarm and serious concern over the statement of Johannes Hahn, the EU’s Commissioner for European Neighbourhood Policy and Enlargement Negotiations who has said that he needs to see evidence of declining media freedom in Serbia. “I have heard this several times [concerns about media freedom] and I am asking always about proofs….I am willing to follow up such reproaches, but I need…evidence and not only rumours,” Hahn told journalists. The recent onslaught on our network is clear proof of what is happening in Serbia. Aleksandar Vucic, Serbia’s Prime Minister, targeted us, unleashing a wave of attacks in which we were branded as “liars”, “mercenaries” and “traitors’. Some of the material has been detailed here: http://birn.eu.com/en/page/birn-under-fire. We see fit to remind Mr Hahn that, coupled with the attacks on us, came attacks on the European Commission itself which has funded an investigative reporting project published by BIRN. It was accused of paying BIRN to attack the Serbian government. In the first week of vicious campaign, 170 reports were published about us. Only four media outlets in Serbia gave BIRN room to respond. No mainstream media reported on the corruption story published by BIRN, which triggered the attacks. By contrast the prime minister’s accusations against us were widely covered. Mr Vucic’s demonstration of power sends the chilling message that a similar fate awaits any other critical voices. Campaigns have now followed against the Serbian Ombudsman and Humanitarian Law Center. 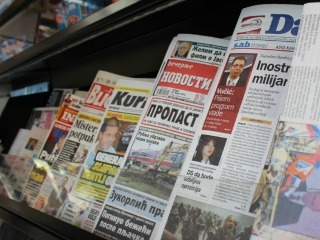 Other media have suffered significant pressures, and journalists talk of direct pressures and self-censorship which has been documented by the Association of Serbian journalists in December 2014. The new World Press Freedom Index ranked Serbia in 67th position, a fall from the 54th place it had one year ago. In Serbia and the rest of the region, there is a widespread belief that democracy and freedom of expression are less important concerns for the EU than the issue of maintaining stability. We believe that this is a grave mistake and that there is no stability without them.